I started this blog with so much enthusiasm and vigor, I cannot believe that I have neglected it for the past year and a half or so. Life has been quite busy after the new addition in our family last year and we are loving every bit of it. 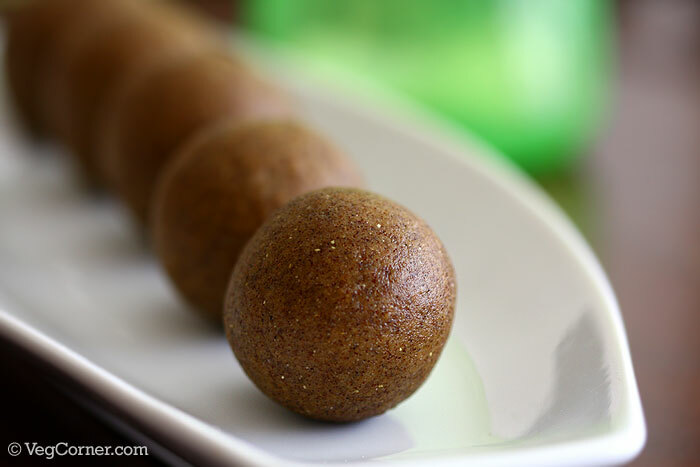 It’s time to revive this space of mine and here I come with a recipe for ragi flour laddu or ragi urundai. 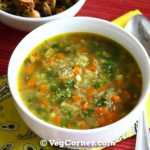 The inspiration for this recipe is partly Hari Chandana and partly my grandmother. Hari Chandana has a wonderful collection of traditional Indian recipes with stunning pictures. I recently tried her Mysore Pak recipe with so much success that I can’t believe how simple it is to make that famous sweet. She also has a never-ending list of urundai recipes and this ragi flour laddu recipe was inspired from one such recipe of hers. She has a simple recipe using ragi flour and powdered jaggery. My grandmother used to prepare a porridge (Kanji) for kids using sprouted ragi flour, pottukadalai (dalia) and a variety of nuts. So I decided to mix both these ideas together and prepared these urundais and it was a huge hit in our house and in my friends’ too. Healthy and delicious treat made with ragi flour, suitable for all ages. Fry the ragi flour in a hot pan for about 7-8 minutes or until the raw smell is gone. Cool it for a couple of minutes. In a food processor/(Indian) mixer, powder the dalia and walnuts separately. Once the ragi flour is cool enough blend it together with the powdered jaggery, ground dalia and walnuts and the optional spices. 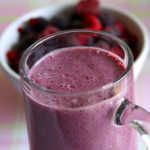 If using a food processor pulse it a couple of times or if using a mixer give it small runs. Transfer the mixture to a large bowl and add the melted ghee little by little just enough for you to be able to shape them into golf ball size balls. If the laddus crumble down while you are shaping them, it’s a clue that it needs more ghee. To make perfectly round laddu, take the mixture using your fingers and hold it tightly with your palm like making a fist. Once it is tight enough roll it lightly between both your palms to get a neat shape. Do not give too much pressure while rolling else it will crumble down. These ragi flour laddus tasted very good. Actually I myself was pleasantly surprised that I was able to make such neat laddus because this is the first time I’m making any type of urundai (ball) sweet. I have always had an opinion that it is too difficult to make. After this experience, I can’t wait to try other similar recipes. The edible camphor I added gave this sweet a very good flavor and aroma. Those of you who have tasted South Indian rice flour puttu made with jaggery and coconut and like it will definitely like this sweet too because it tasted very much like that. My husband who is not a “sweets” fan and who does not get easily tempted by sweets couldn’t stop eating this because the taste was so addictive. I was able to get roasted ragi flour in a Sri Lankan Grocery store but I did roast it again because I felt that the flour still had a raw smell. Even while roasting you get this raw smell and you will be able to tell when roasting is enough. So if you start with raw ragi flour the roasting time maybe even more than the 7-8 minutes I have mentioned. You can use just dalia instead of walnuts if you want to avoid nuts. 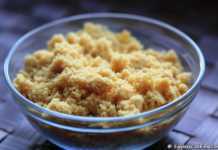 You can use powdered white sugar too instead of jaggery. At first, I added just 1 and 1/2 cups of jaggery and after tasting I felt that it need little more so added another 1/4 cup. Warm milk can also be added instead of melted ghee, but I’m not sure how long the laddus will keep good. The ones made use ghee keeps good for about 8-10 days. Maybe even more but we finished it off in our house. Thanks for the recipe!! 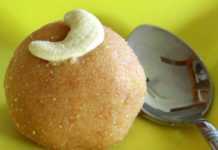 It is so easy to make and the laddoo turned out great!! Thanks for the ragi recipe. I was searching for ragi recipes and now I have found a source. The ragi laddu sounds good. I am a heart patient and also diabetic. I will prepare the laddu and taste it once. 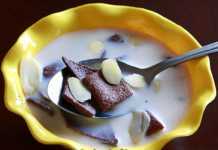 Can u suggest some more recipe with ragi so that it can be taken while on travel? This ragi and walnut sweet ball is very tasty. I never expected that I too will be able to prepare laddu in a tasty manner. Sweet Ragi Dosa is my favourite . Just Soak a cup of ragi flour in jaggery and water .Add 2 tsp of rice flour for crispiness.Add saunf seeds and some coarse ground pepper. 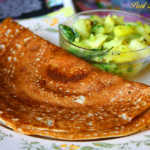 Soak for 2-3 hours and make dosas on a non-stick tava using few drops of ghee instead of oil. 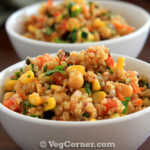 Thanks for the recipe Medha. It sounds interesting. Good to see you back, Madhu. I recently made sesame seeds and oats laddu and it was finished in no time. Must try with ragi flour next time round. I’d probably go slow on roasted chickpeas and use oats and almonds. Congratulations! Happy come back. This laddu is tempting very much. Very good photograph.